Living in Houston, it’s fair to say we almost always do "want fries with that." But sometimes we want them on their own, too. Especially when they are thrice (yes, THRICE!) 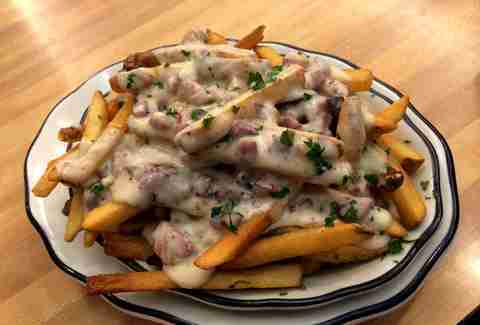 fried and covered in things like chile con queso, truffle cream, and pastrami, à la these best fries below. 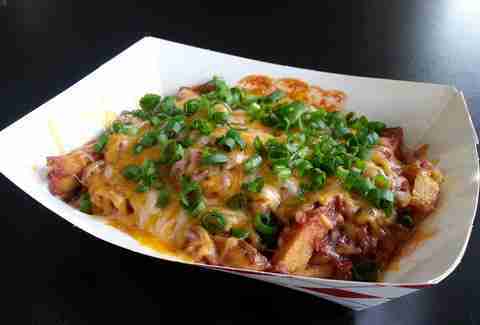 Houston’s favorite bus-gone-brick & mortar makes fresh-cut fries you’ll want to stay after school for. 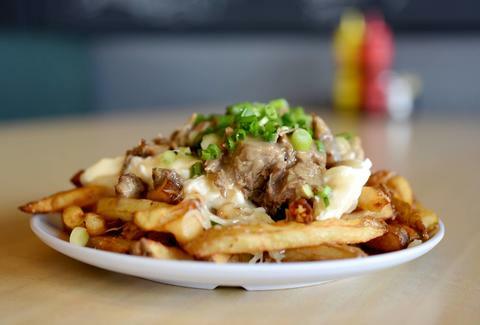 Go for the Lunch Lady Fries -- covered in house brown gravy, slow-cooked beef, local cheese curds, and aged white cheddar. 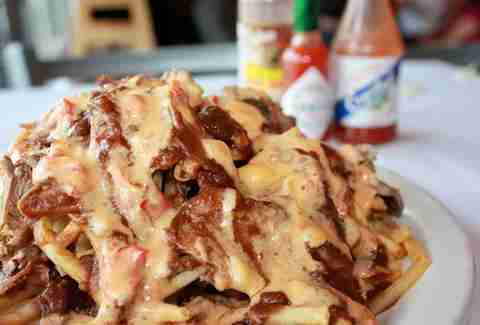 Also a strong move: the Honor Roll Fries, where the combination BBQ brisket, bacon, and cheddar earns an A+. Nailed it! This Jewish deli coats its fresh-cut, twice-fried Schmutzy Fries in a Gruyère, white cheddar, Parmesan, and truffle cream Mornay sauce... then tops them with chunks of the best house-cured pastrami in the city. The result is a pile of fries that are totally not kosher, but seriously delicious. We don’t need In-N-Out in Houston. That’s because these animal-style fries have 10 times the flavor thanks to a fiery, Pakistani 10-spice blend. Booya, Cali. These hand-cut fries are seriously crisp thanks to their triple-cooking method. Hit up the truck and pray that they're serving "Korelina" fries that day -- those frites come topped with gochujang and Carolina BBQ sauce, wasabi mayo, slow-cooked pulled pork, fried onions, and cilantro. Double points go to anyone that get through the Cajun take on poutine -- in which a mountain of shoestring fries gets covered in chile con queso, rich gravy, and mouthwatering roast beef -- by themselves. Eat them late-night, or anytime where you can take a nice long nap afterward. Twiggy, fresh-cut fries are crisper than the shirt you’re mom just ironed for you (are you ever going to start doing that by yourself?). Get them slathered in kimcheenaise and coated with a warm, pork belly blanket. Sure, you can get these twiggy pommes frites with a side of steak, but you can also get them with a side of FOIE GRAS. The Lazy Lane Frites are an off-the-menu specialty tossed in au poivre gravy, dusted with Parmesan, and heaped with seared foie. Topped with everything from red-eye gravy and curry sauce to chicken livers and house-made chorizo, this brew pub’s playful taters are worth getting to know, unlike your recent Tinder dates. Heyo! 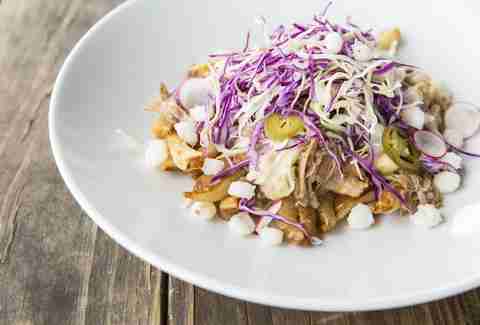 Warning: this food truck’s Southern-style poutine is highly addictive. Hit it up to get old-school crinkle cut fries drowned in blackened Gulf shrimp, Louisiana crawfish, lobster, roasted red pepper coulis, and a rehab-worthy smoked Gouda sauce. Then add bacon, because you ALWAYS ADD BACON, FOOL. 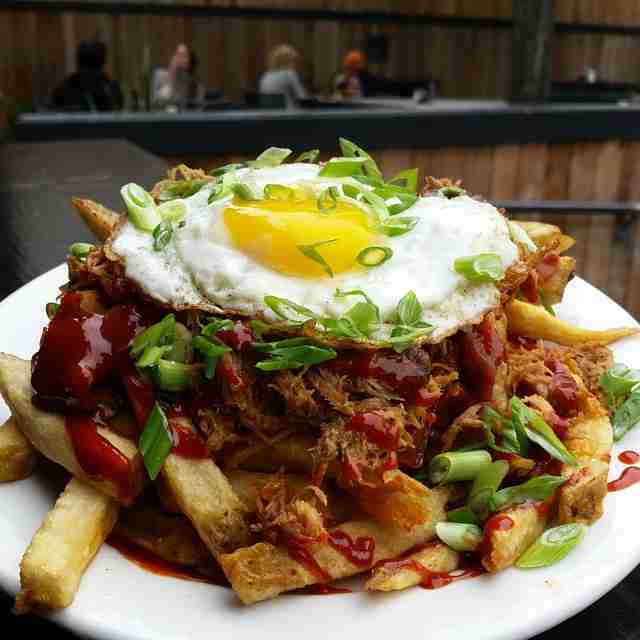 You can eat C&C’s totally coated Red Eye Fries as a pre-game to brunch, lunch, or dinner, giving them triple the street cred. The hand-cut taters are bathed in buffalo chili, hot sauce, melted cheddar, and mustard seed before getting topped with a yolk-up egg. Nothing served on a piece of cardboard has ever been so beautiful. Or so fattening. 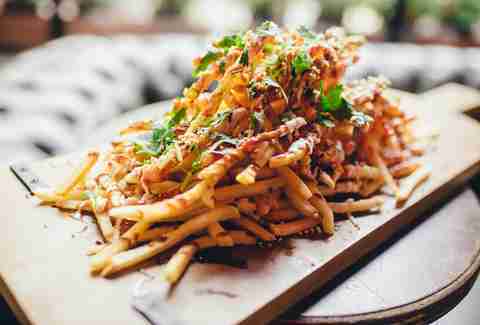 Good thing the plates of shoestring fries stacked with smoked pork shoulder and drizzled and dusted with yellow curry, garlic mayo, Sriracha, and hoisin are big enough to share. Or not. Whatever. This burger joint’s fresh-as-hell, daily-cut potatoes get a double-dip in the deep fryer, making them uber crisp and crunchy on the outside with a soft, pillowy center. They’re excellent with HG’s special mayo sauce, but hit the Heights location to add on wing sauce and blue cheese or country cream gravy and bacon to make you inner fat-kid proud. 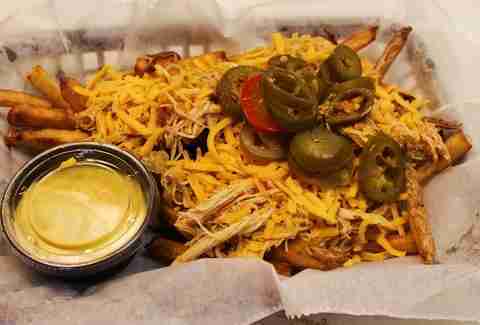 You can expect this fry house’s house fries to be hot, fresh, and fully loaded in flavors like pulled pork, chili cheese, or chicken fajita. Of course, you could also get your potatoes in the seasoned, curly, waffle, tot, or sweet potato variety. Maybe get them all? 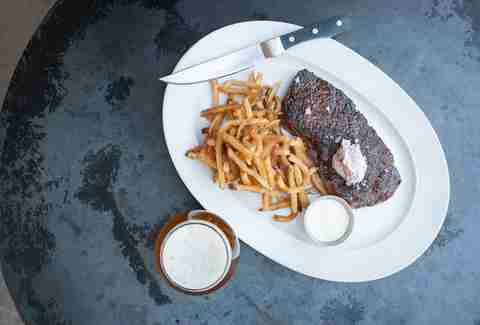 This hugely popular beer bar changes up its poutine-style fries every so often, but each iteration proves to be good as hell. Right now you can get the hand-cut potaters loaded with succulent braised pork in pozole sauce, cheese curds, and pickled jalapeño & hominy. 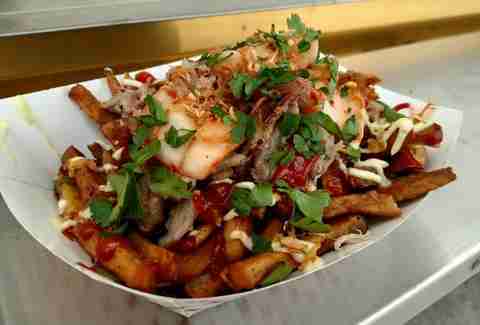 Fry addicts know to hit this Korexican BBQ truck up for the bulgogi-, kimchi-, spicy mayo- and queso-coated KimCheese fries. And also the burritos stuffed with said fries. 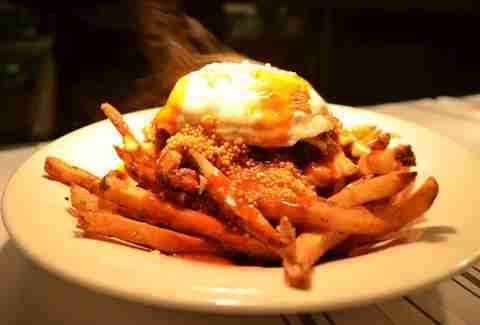 Fries topped with melted cheese and python chili (yeah, you heard that right) are the winner at this wild game joint. Game over.